It’s back-to-school week across the state. Students in the University of Wisconsin System are heading back into their lecture halls for another year of sifting and winnowing. On Tuesday, we reviewed the state of K-12 education, and now it’s a good time to take a look at how students in Wisconsin’s universities and colleges are faring. As we wrote earlier in the week, the Department of Public Instruction (DPI) released a large dataset for Wisconsin students in March of this year. Part of that data included figures on the percentage of students enrolled in postsecondary institutions after their graduation from Wisconsin high schools. The trend is clear. Fewer and fewer students are choosing higher education. Of all 2017 graduates, 55 percent are enrolled in a postsecondary institution. That’s down from 62 percent of 2016 graduates. The trend is even more clear when you look just a few more years back. Of 2013 high school graduates, 71 percent are enrolled in a postsecondary institution. That’s a 16-point swing in just a matter of a few years. This figure measures the number of students who report being enrolled in an institution of higher learning today. That means the numbers are updated every year, and slowly tick up as students who take gap years end up in school down the road. The trend remains, however. More students are choosing not to move on to college. This shift can be interpreted a number of different ways. A highly skilled, highly educated populace is a good thing, and college degree attainment almost always translates to higher wages. Yet, as the cost of college rises, more students are deciding that the cost-benefit analysis doesn’t work in their favor. The job market has improved significantly since 2011, so more students may have jobs lined up right out of high school. Students from different areas of the state are making the same types of choices. Of Milwaukee Public Schools’ 2017 graduating class, just 40 percent are enrolled in postsecondary institutions—down from 49 percent of the class of 2016. Of those who graduated from Madison Metropolitan in 2017, 63 percent are enrolled at a postsecondary institution, down from 69 percent of 2016 graduates. Farther north, Green Bay Area Public graduates are continuing the trend in even greater numbers than the state average. Fifty-two percent of the class of 2017 are enrolled somewhere today, compared to 71 percent of 2013 graduates. As fewer Wisconsin students choose postsecondary education, UW System enrollment is still increasing over the long term—174,516 students attended the system in Fall 2017. 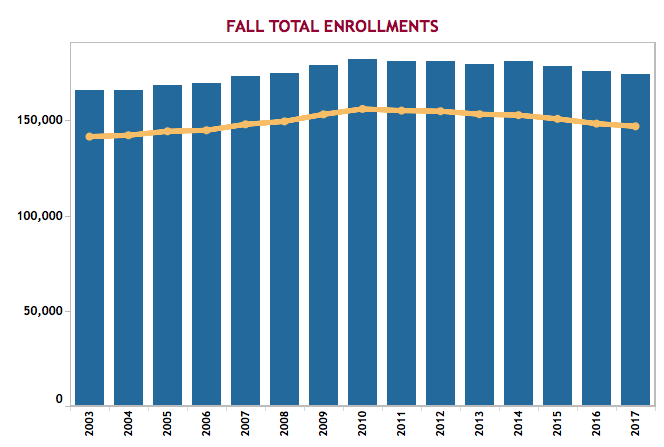 Enrollment in the system has slowly decreased since 2010, but has grown substantially since its inception. Student enrollment trends vary greatly at different institutions. UW-Madison, for example, has seen its overall headcount increase by 4.4 percent since the 2008-09 school year. At the same time, enrollment at UW-Milwaukee – the system’s other doctoral university – fell by 13 percent. Blue bars represent student headcount, while yellow line signifies full-time students. Traditionally, approximately one-third of Wisconsin high school students enroll in the UW System immediately after graduation. In 2016, the most recent data available, that number was at 31.7 percent. 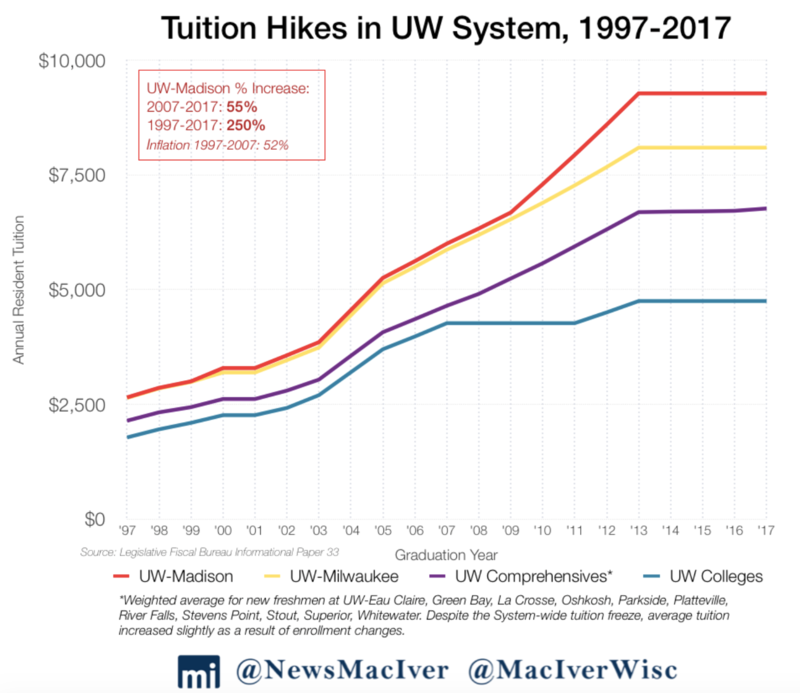 One of the biggest changes in UW policy in recent years has been the state-imposed tuition freeze. That began with Gov. Scott Walker’s 2013-15 budget, and the policy has been renewed in every budget since. Read more about the UW’s current budget, which runs through 2019, here. We covered the issue of remedial education in yesterday’s State of K-12 Education, but the issue is important enough to revisit. In the fall of 2016, according to the most recent data available, students from 184 Wisconsin high schools entered the UW System requiring remedial math or English. That’s an increase from 175 schools in 2015. What does that mean, exactly? It means those students graduated high school and were accepted into the UW while still needing additional help in subjects like algebra. Fifteen high schools sent students to a UW school where 50 percent or more of their incoming class needed remedial math. Nine of those 15 schools are in Milwaukee. As for English, 27 schools had 10 percent or more of their graduating classes needing English remediation at the UW. 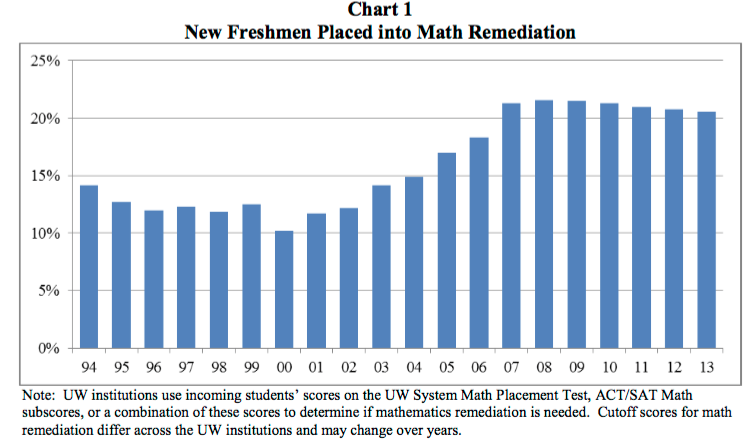 According to a UW System report from 2013, more than 20 percent of new freshmen at the UW required math remediation. In recent years, it appears that the UW System has worked more closely with K-12 schools to address the problem of remedial education. A June 2017 presentation to the UW Board of Regents showed new efforts to build bridges between the two educational systems. Goals include reducing the number of incoming freshmen who need remedial math, expanding the first year completion rate for remedial math, and expanding student success in first-year regular math courses. Unlike many other states, Wisconsin does not require that high schoolers take four years of math. The UW System is now officially recommending that students take a fourth year of math in high school, noting that 20.7 percent of those who did not complete math their senior year were placed in remedial or developmental education. Just 7.5 percent of the students who did take math as high school seniors needed the remedial course. It’s important to note, too, that remedial courses do not count for college credit. Students take remedial classes at the full price of tuition, but they earn zero credits. With all the discussion of college affordability these days, the prevalence of remedial education would be a good place to start. The university system, by way of providing these courses, expends considerable resources to get students caught up to speed. Meanwhile, students and their families pay thousands of dollars for courses that should be their high school’s responsibility. 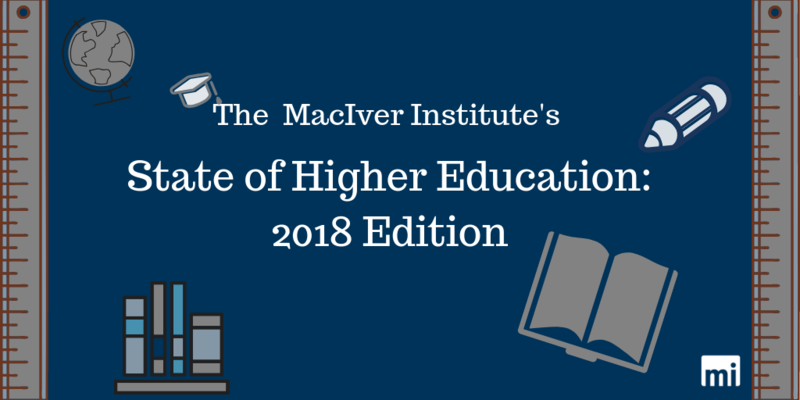 That wraps it up for this year’s State of Higher Education: 2018 Edition. We hope you found this roundup helpful and informative. Any issues we’re missing? Just drop a comment below. Go Badgers!